Please read these Terms of Service (“Terms”) carefully before using the website: http://www.textmyjournal.com (the “Service”) which is operated by TextMyJournal (“TextMyJournal”, “us”, “we”, or “our”). Your access to and use of the Service, including any private membership areas, is conditioned upon your acceptance of and compliance with these Terms. These Terms apply to all visitors, users and others who wish to access or use the Service. By creating an Account (which includes signing up for a username and password for personal log-in to a private membership area) on our Service, you agree to subscribe to newsletters, marketing or promotional materials and other information we may send. You may also subscribe to our newsletters and e-mails without creating an Account. You may opt out of receiving any, and all, of these communications from us by following the unsubscribe link and instructions provided at the bottom of any email we send. Our Service allows you to post, link, store, share and otherwise make available certain information, text, graphics, videos, or other material (“Content”) in both public forums and private membership areas. Under both scenarios, you are responsible for the Content that you post on or through the Service, including its legality, reliability, and appropriateness. This service shall not be used for any submission, storage, retrieval, or distribution of pornographic content in any form. By posting Content on or through the Service, you represent and warrant that: (i) the Content is yours (you own it) and/or you have the right to use it and the right to grant us the rights and license as provided in these Terms, (ii) the posting of your Content on or through the Service does not violate the privacy rights, publicity rights, copyrights, contract rights or any other rights of any person or entity, and (iii) you agree to defend against and indemnify us from any and all third-party claims or complaints related to such materials. You retain any and all of your rights to any Content you submit, post or display on or through the private membership area and you are responsible for protecting those rights. We take no responsibility and assume no liability for Content you or any third party posts on or through the Service. TextMyJournal has the right, but not the obligation, to monitor and edit all Content provided by users in public forums, including but not limited to comments on blog posts. TextMyJournal can only access private membership area Content with the user’s express permission. Sharing private and proprietary information from private member areas with anyone else. The Service includes materials protected by intellectual property laws, including but not limited to written text, logos, photos, designs and graphics and are the property of TextMyJournal or used with permission. You may not distribute, modify, transmit, reuse, download, repost, copy, or use our content, whether in whole or in part, for commercial purposes or for personal gain, without express advance written permission from us. The trademarks, names, logos and service marks (collectively “trademarks”) displayed on this website are registered and unregistered trademarks of TextMyJournal. The written content, graphics, designs, photographs, videos, and other original content (collectively “copyrights”) displayed on this website are protected by copyrights. Nothing contained on this website should be construed as granting any license or right to use or reproduce in whole, or in party, any trademark or copyright or other protected material without the express written permission of TextMyJournal. When you create an account with us, you represent and warrant that you are above the age of 18, or have express permission of a legal guardian to create an account if you are over the age of 13 but not yet 18. You also represent that the information you provide us is accurate, complete, and current at all times. Inaccurate, incomplete, or obsolete information may result in the immediate termination of your account on the Service. We reserve the right to refuse service, terminate accounts, remove or edit public content in our sole discretion. 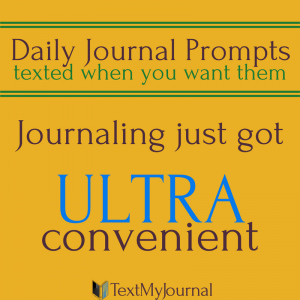 TextMyJournal will charge according to the user’s selected recurring plan. The payment term begins the first day following the free trial. A user who enters payment information on account billing page authorizes TextMyJournal to withdraw funds according to agreement. Failure to make the proper payment will result in suspension of the user’s account. In the event that the account is suspended, the user will still be able to access previous content. If paying by debit card, or credit card, you give us permission to automatically charge your credit or debit card as payment for your Program, Product, or Service without any additional authorization, for which you will receive an electronic receipt. In the event that payment is not received by the date due, you will have a three (3) day grace period to make the payment. If payment is not received, you will still retain access to the Content you submitted to the Account but will not be able to add Content or receive prompts unless and until payment is renewed. All information obtained during your purchase or transaction for our Services and all of the information that you give as part of the transaction, such as your name, address, method of payment, credit card number, and billing information, may be collected by both us and our payment processing company. You agree to only purchase goods or services for yourself or for another person for whom you are legally permitted to do so, or for whom you have obtained the express consent to provide their name, address, method of payment, credit card number, and billing information. You agree to be financially responsible for all purchases made by you or someone acting on your behalf. You agree to use our Services for legitimate, non-commercial purposes only and not for speculative, false, fraudulent, or illegal purposes. Since we have outlined a procedure in which to submit a refund request, we do not tolerate or accept any type of chargeback threat or actual chargeback from your credit card company. In the event that a chargeback is placed on a purchase or we receive a chargeback threat during or after your purchase, we reserve the right to report the incident to all three credit reporting agencies or to any other entity for inclusion in any chargeback database or for listing as a delinquent account which could have a negative impact on your credit report score. The information reported will include your name, email address, order date, order amount, and billing address. Chargeback abusers wishing to be removed from the database shall make the payment for the amount of the chargeback. Our Service may contain links to third party web sites or services that are not owned or controlled by TextMyJournal. TextMyJournal has no control over, and assumes no responsibility for the content, privacy policies, or practices of any third party web sites or services. We do not warrant the offerings of any of these entities/individuals or their websites. You acknowledge and agree that TextMyJournal shall not be responsible or liable, directly or indirectly, for any damage or loss caused or alleged to be caused by or in connection with use of or reliance on any such content, goods or services available on or through any such third party web sites or services. We may terminate or suspend your account and bar access to the Service immediately, without prior notice or liability, under our sole discretion, for any breach of these Terms or other inappropriate use or misuse of the site. No refund will be offered. If we terminate or suspend your account or the site without cause, we will provide you notice at least 10 business days in advance to provide you an opportunity to download any content you uploaded or entered on the private membership site and refund any monthly dues on a pro-rata basis within 30 days. If you wish to terminate your account, you may simply discontinue using the Service through the “Cancel Subscription” button at the bottom of the billing page within your account. If subscription is cancelled, services will continue through the end of the billing cycle. If you desire service to cease service immediately, you must text “stop” or “cancel” to the phone number from which you receive prompts, in addition to following the steps for cancellation as described above. No refund will be offered. If services have not been delivered as promised, a refund may be requested within 30 days by emailing team@textmyjournal.com. An email request does not guarantee a refund. Each email will be reviewed individually and TextMyJournal has sole discretion in determining whether to issue a refund in whole or part. Although care has been taken to ensure the accuracy of the information on this site, including but not limited to the information in connection with the products and services provided by TextMyJournal, TextMyJournal assumes no responsibility. Therefore, your use of the site is at your own risk. Although information on this Site has been carefully checked for accuracy, no guarantee is given to the completeness and correctness, including but not limited to the product specifications, functions, and prices. The product introduction, prices or other marketing and promotional information does not constitute an offer for purchase. You shall contact TextMyJournal for the up-to-date information on TextMyJournal products and services. THE INFORMATION, PRODUCTS AND SERVICES OFFERED ON OR THROUGH THE WEBSITE ARE PROVIDED “AS IS” AND WITHOUT WARRANTIES OF ANY KIND EITHER EXPRESS OR IMPLIED. TO THE FULLEST EXTENT PERMISSIBLE BY APPLICABLE LAW, WE DISCLAIM ALL WARRANTIES, EXPRESS OR IMPLIED, INCLUDING, BUT NOT LIMITED TO, IMPLIED WARRANTIES OF MERCHANTABILITY AND FITNESS FOR A PARTICULAR PURPOSE. WE DO NOT WARRANT THAT THE SERVICE OR ANY OF ITS FUNCTIONS WILL BE UNINTERRUPTED OR ERROR-FREE, THAT DEFECTS WILL BE CORRECTED, OR THAT ANY PART OF THE WEBSITE, INCLUDING MEMBERSHIP PAGES, OR THE SERVERS THAT MAKE IT AVAILABLE, ARE FREE OF VIRUSES OR OTHER HARMFUL COMPONENTS. WE SHALL NOT BE LIABLE FOR ANY DIRECT, INDIRECT, INCIDENTAL, SPECIAL, CONSEQUENTIAL OR PUNITIVE DAMAGES THAT RESULT FROM THE USE OF, OR THE INABILITY TO USE, THE WEBSITE, INCLUDING ITS MATERIALS, PRODUCTS, OR SERVICES, OR THIRD-PARTY MATERIALS, PRODUCTS OR SERVICES MADE AVAILABLE THROUGH THE WEBSITE OR FOR THE COST OF PROCUREMENT OF SUBTITUTE SERVICES. You agree that TextMyJournal’s entire liability, and your exclusive remedy, with respect to any service(s) provided under this Agreement and any breach of this Agreement is solely limited to the amount you paid for such service(s). Users shall defend, indemnify, and hold harmless TextMyJournal, its officers, officials, employees, and volunteers from any and all claims, injuries, damages, losses, or suits including attorney fees, arising out of or resulting from Content submission, storage, or retrieval, or acts or omissions of the user not in accordance with this agreement or violate federal, state or local laws or regulations. If you have any questions about these Terms, please contact us at team@textmyjournal.com.